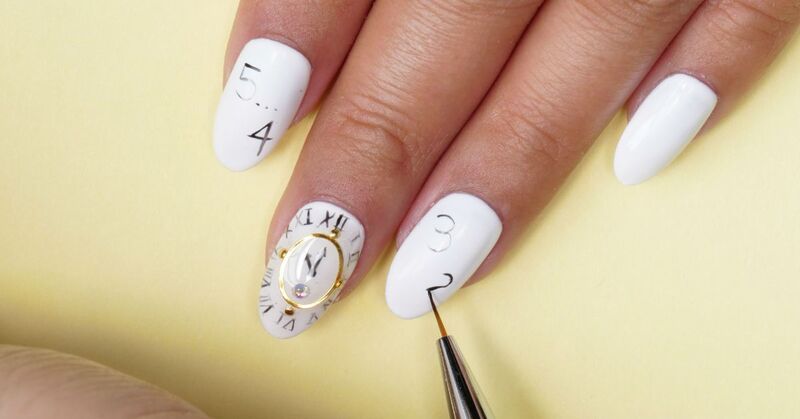 Bring a dose of elegance to your manicure with this vintage-inspired clock design. The clock will be counting down the seconds before the ball drops, just like you and everyone else around the globe. Watch this easy-to-follow tutorial to learn how to nail the look. The best thing about getting a manicure is that you can always tailor the look according to your unique personality. You can have lots of fun with this countdown design by trying out different types of stylish fonts on your nails. You can even indicate the time by painting a mechanical or analog clock display. 1. Apply a few coats of a white gel nail polish on your nails. 2. Dab on a small amount of the builder gel at the center of your desired accent nail. 3. Place a circular nail art gem on top of the builder gel. Use the tweezer to position it properly. 4. Use the black gel polish and striping brush to paint mechanical clock numbers on your accent nail. 5. Draw the hand shaft and clock hands in the middle of the circular nail gem. 6. Add another layer of the builder gel in the center of your accent nail. 7. Use a dotting tool or striping brush to strategically place tiny gems around the perimeter of the circular gem. Watch the video for proper placement. 8. 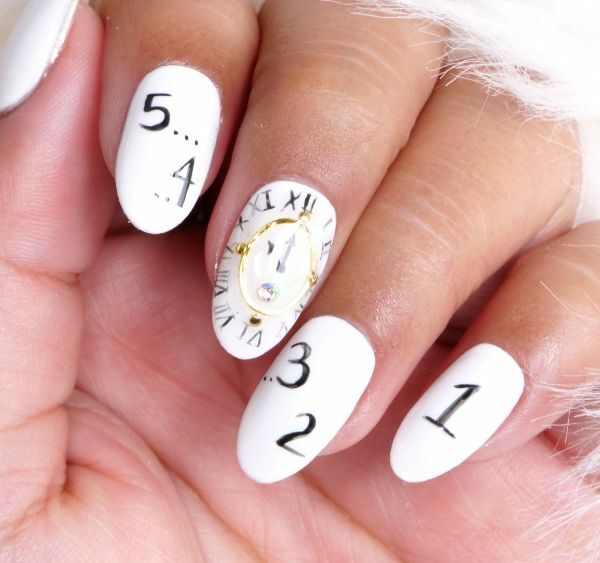 Write the countdown numbers on the rest of your nails, starting with the number 5.